Every relationship goes through ups and downs. It’s the way of life. I don’t know a single couple that not at one or another time had some rough patches. It usually starts small with some kind of disagreement, that evolves into something bigger, something unbearable, until one day you either get over it or you don’t. At which point it’s best to re-evaluate yourself and your partner and think carefully if you really do want to spend the rest of your life with that person. Now, A and I recently went through a very rough patch. It was very difficult to get up in the morning, every movement hurt and all I could think about, was ‘Why?’ Why did I feel the way I felt, why didn’t we prevent this, how did we not see this coming? The answer is easy: My little teenage brother Wii (the only person I know that travels with his wii in his backpack) came to visit us last week. Him and I had a full program planned. Enjoying and exploring Oslo in the ice and cold. We saw the Opera, the castle, Sognsvann, Vigalandspark, Holmekollen, all kinds of good and fun stuff. It was awesome having someone to show around but also exhausting. On Friday, a day before Wii’s departure, we had nothing planned, other than relaxing, after all we truly deserved it. But something in me felt restless, I felt the desperate need to get out of the house and do something extraordinarily. Bungee jump? No, too cold. Swimming? No, too cold. Shopping? No, too cold. I googled all kinds of winter-activities and then found this: http://www.akeforeningen.no/ – a two kilometer long toboggan run, and I know what you all are thinking: Oh, that sounds like good children’s-fun. I guess it would have been, if it weren’t for the ice, the snow and the cold, so to me it felt more like a live-or-die-experience. Wii was totally up for it and so was I (at least I pretended to be) but A said, he didn’t want to go. I begged and pleaded for about an hour until he finally gave in. So we headed out at about 3pm – fully dressed, which for us meant: three layers of clothing – no skiing-pants (because we still do not own anything remotely close to it) – and my brother appropriately dressed in skiing pants and jacket. After an hour commute (while enjoying a wonderful landscape!!) we finally got to the rental place and A’s eyes light up. He was jumping around like a 4-year-old in a candy store. After a few simple instructions did we receive our sleds and helmets (included!!) and we finally went down the toboggan run. The first 100 meters were super easy and manageable, easy to stir the sled, the turns were doable, a very enjoyable ride. But then: All of a sudden the run turned into the ride of my life. Unbelievably tight turns, right left right left right left and for some odd reason all the ice landed in my face, which made stirring and watching where I was going incredibly difficult. Needless to say that half of the snow of the run ended up on my clothes. Somehow I survived the 15 minutes in hell, already frozen to death but ready to get on again. The subway was only a minute away from the end of the run, so all you had to do is jump in, ride the subway for about 15 minutes and then go down the hill again, yes in this regard Oslo is just freaking awesome. So after enjoying the view again, all three of us were ready hit the run again. According to A, flew I down the run like a maniac, going faster and faster, to a point where he lost sight of me. All happened so fast and quickly that A only caught a glimpse of me laying in a hill of snow, covered in ice, not moving. 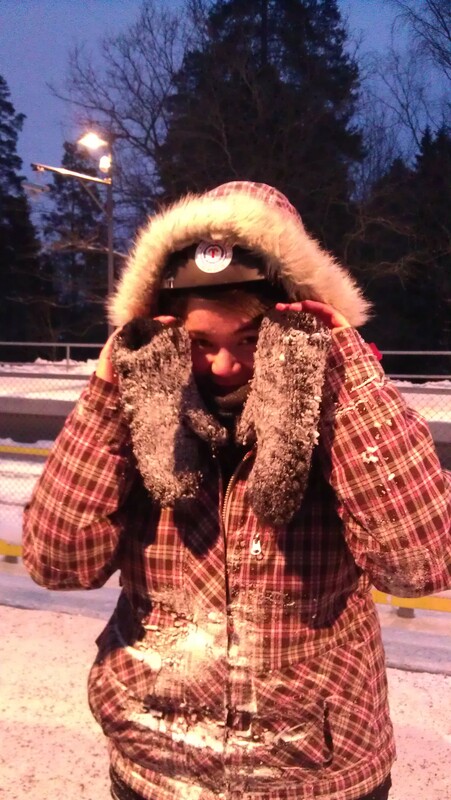 I am not quite sure what exactly happened, I must have sledded over a block of ice and lost control over the sledge. A couldn’t hold his laughter back, he said he never saw anyone covered in so much ice and snow, needless to say, I didn’t laugh. By this point I had ice and snow everywhere, I was frozen and just ready to go home but I was in the middle of the run, so naturally I jumped back onto my sled and flew – this time not quite as fast – down the run. Somehow we made it home that day, I vaguely remember heating myself up at our fireplace, thinking to myself, life is good. Yes, the rough icey patch on the sled was quite a painful experience (the bruises still visible on my body) but having A here with me, that just makes everything worth while!